Hawaii Native Status: Native (indigenous). 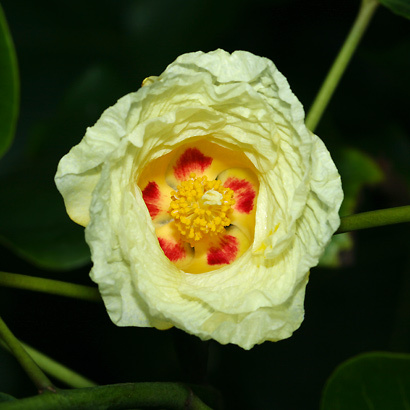 This plant is most likely native to Hawaii, but it was also introduced here by the ancient Polynesians. Description: The flowers are tulip-shaped, only partly opened, up to 3 inches (7.6 cm) long, and have a cup-shaped calyx, a yellow staminal column, and 5 heavily crinkled, overlapping, yellow aging to pink petals with red at the base. 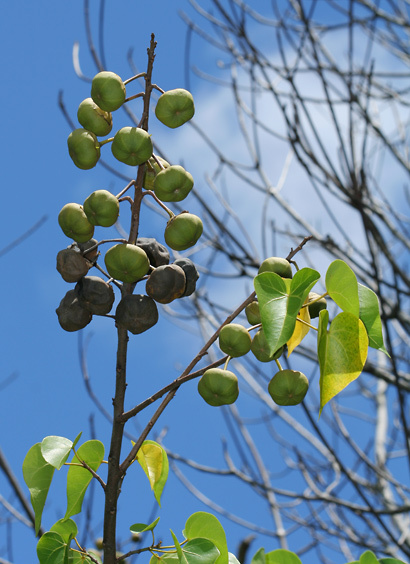 The flowers are followed by rounded, somewhat flattened, 5-angled, 1 to 2 inch (2.5 to 5 cm) in diameter, leathery, green drying to brown seed capsules. 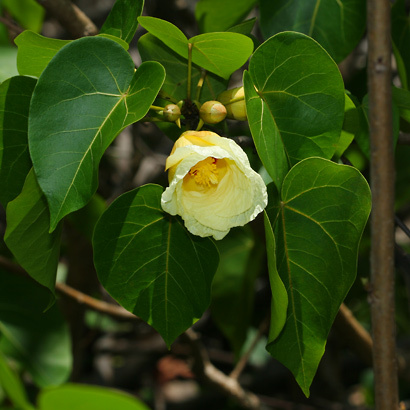 The leaves are shiny, yellow-green to dark green, somewhat fleshy, alternate, and heart-shaped. The bark is gray and lightly fissured. Here in Hawaii, Milo grows along the coast and can tolerate brackish water. 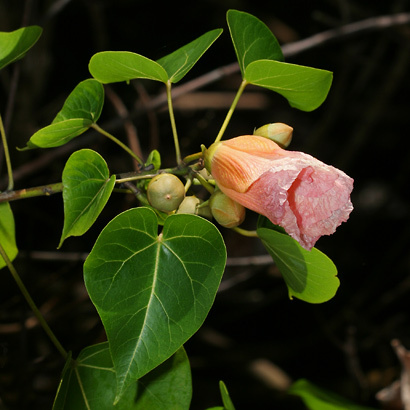 The similar Hau (Hibiscus tiliaceus) also grows along the coast and has color-changing flowers and heart-shaped leaves, but it has more widely opened flowers with conspicuous lanceolate sepals. 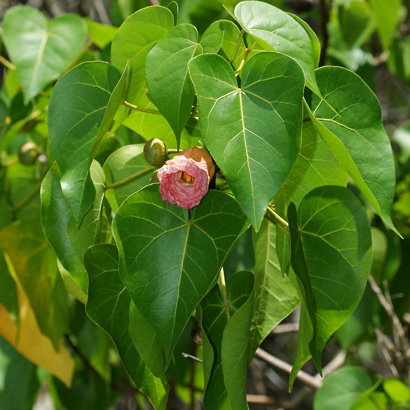 Canoe Plant – Although it likely already existed here, Milo was also brought to Hawaii by the ancient Polynesians in their canoes. The attractively grained wood takes a high polish and was used to make food bowls and plates because it would not flavor the food like some other types of wood. The bark was used for fiber to make cordage. The young leaves were eaten. The fruits were used to make a yellowish green dye. Edible – The young leaves are edible.